Lola Zeitman is an accomplished oil & gas industry geologist, as well as a devoted wife and mother to three children. She is also discovering that she is a nascent telepath and that a woman she has never met desperately needs her help. In Nigeria, a young woman called Somadina has discovered that her ability to “read” people, a talent that had lain dormant since her childhood, has returned and that her sister, Nwanyi, may be not only be locked into an odious marriage arrangement, but may also be in great danger. The two women, drawn together by mutual bonds of ability and need, find that not only are they not alone in their empathic abilities, but that they must save not only Nwanyi, but the unsuspecting victims of a terrorist plot. The novel (the title of which can be stated as “to the power of zero”), is cited as an “interactive” novel. There are hyperlinks throughout the text that refer the reader to various sources of further information: pronunciation guides, background music references, photographs, opinion pieces, and the like. According to the “A note to my readers”, these links will be monitored for breakage and updates will be found at the website established to promote the book (and the upcoming sequels). In practice, the format veers away from the non-linear, “choose-your-own-adventure” style of other interactive novels book and, instead, maintains a traditional linear narrative that simply gives the reader outside opportunities to enhance the experience and explore. This actually works fairly well–especially for readers (such as myself) that often spring to the keyboard to search for various bits of interest we encounter as we read. And for those that lack an e-reader with the ability to follow hypertext, the reader is provided enough contextual clues to ensure that the links are not necessary to understand the plot. Cronin maintains a fairly brisk pace and manages to juggle multiple points of view and storylines with practiced skill. The principle characters are well-drawn, interesting, and sympathetic. The antagonist, the coldly calculating Djimon, is particularly chilling–clinically ruthless and blindly self-righteous. Further, it’s clear that the author has done extensive research into the various cultures and industries she describes. The plot clicks along on its own momentum and wrestles with worthy themes of acceptance, human interconnectedness, and cross-cultural communication. The ways in which Cronin presents telepathic communication–as well as the implications for its existence–are well-executed and just plain interesting. She does a good job of imparting a layman’s understanding of complex philosophical and metaphysical ideas. There are, however, a few nits that need to be picked. At the beginning of the novel, the author tends to provide parenthetical guides to the pronunciation of various non-European names–guides that interrupt the flow of the story and serve to take the reader out of the text. In fact, it would have been more appropriate to use a hyperlink on the name instead of the in-text notation. Further, this book does have a lot of info-dumping; all of it necessary to the plot, but still daunting. However, Cronin handles the large amount of contextual information well and seldom loses the reader during those sequences. While the character of Lola is well-drawn and likable, I found that the character of Somadina and her story were far more interesting–in fact, I think that Somadina would make a fine hero for a novel in her own right. There is also the problem of the climax which, while suspenseful, edges uncomfortably close to paternalism. The story would have been better served if Somadina had taken a more active role in the final events. Nevertheless, x0 is a fine, enjoyable read for those interested in some intriguing notions on the nature of telepathy and an ultimately optimistic story with characters you can root for. And for those that want more, the novel is slated to be the first in a six-book series. This entry was posted in Reviews and tagged ebooks, fiction, interactive, novel, review, sci-fi, sherrie cronin. Bookmark the permalink. 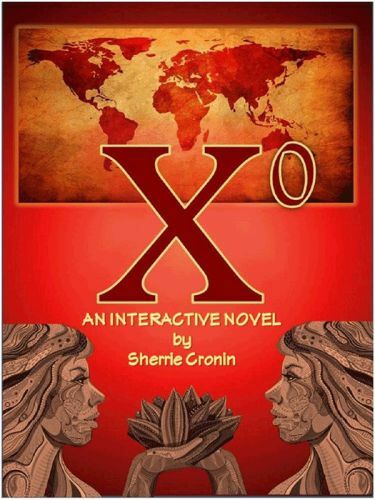 Shedrick – enjoyed reading your review of Xo. Agreed with your approval of the interactive format, and the way the researched information, which was interesting to me in it’s own right, was massaged into the tapestry of the novel, so that it didn’t lose the reader. Your comments about the pace were on target. The novel kept pulling me along at a fun, comfortable clip! Am looking forward to Cronin’s next installment. . . and your review of it!